FBC Alamo Forum for Accountability and Integrity: "Stolen Domain Name & Web Site Redirect"
A forum for the discussion of accountability, transparency and integrity among the pastor, among the deacons, among the church staff and among the membership of First Baptist Church in Alamo, Tennessee. "Stolen Domain Name & Web Site Redirect"
It's pretty low when an alleged "man of God" tells half truths and lies. But why should we be surprised? There are more than one set of commandments in the scriptures. But the command not to bear false witness appears in all of them. It is sad when leaders feel it necessary to lie and mislead others because they refuse to win souls as Jesus himself commanded. If it were important, I would do more about it. 1) Misleading accusations such as "Stolen domain name..." are simply lies. There is no other way to describe it. It is a lie. 2) There was no "unanimous decision to relocate several years ago." There was no actual congregational vote as one would expect when asking a multi-year commitment of several million dollars. There was the bully vote, a broad query of asking everyone to stand to support something, always followed by mass movement. It's called the heard instinct, one a few move, the rest follow along. A unanimous vote was impossible to know since there was no accurate vote ever taken. Amazing that plenty of church members were certainly vocal against the move. Yet it is still being presented as a "unanimous decision" which was far from the truth. NOTE: Unfortunately it is typical in situations where leadership is pushing an agenda to omit a formal vote and instead, simply get the folks stirred up emotionally, to gear excitement towards the planned agenda as opposed to honestly asking for a decision. Emotions often win over logic. Entire sessions are designed to get railroad in the response needed, not to seek the truth. For example, the plan will be presented over a period of weeks or months. Then when the deadline comes, instead of having a legitimate vote, there will be a "cheer-leading" session followed by the question. Instead of "If you are for this decision please stand, all opposed remain seated" or something like that, the question is usually stated similar to "If you want God to continue to lead us on to greater things, then STAND UP!" or something like that. Rarely is there the chance given for the opposition to do the same. 3) My father was never for the move in any way but it was presented as though he "was in favor" of it. Not at all. But my father knew it was going to happen, like several church members did. There are organizations whose business model and services are designed to systematically present the leader's or his committee's personal agenda as God's will and to convince the congregation of that. My father was a good man and provided products and services to the church during the planning like he always did. If they had a need, he helped out. But that was in no way an endorsement of this unnecessary move, providing activity rather than actually winning souls. There were long-time members against the move. Some have passed on, some are still there and some have moved on, as one staff member told me to do if I didn't like it. Oh the love of Jesus...how it is forgotten when we want to get out agenda pushed through. THE TRUTH?? 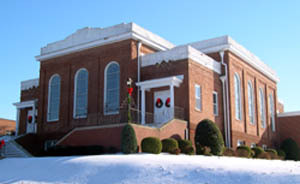 When asked about the church move, my father's verbal response was that they better fill all those empty pews before worrying about moving to a new location. Like many, my father was aware that the pastor at FBC Alamo is on a career track. Ten years is about their limit there. Most are ready to move to greener pastures...unless they get their way. This forum is for Accountability and Integrity regarding First Baptist, Alamo. It is clear that this blog should be taken more seriously now even than when it began. I resent being called a thief publicly, slandered and accused of something that was neither necessary to do nor of my nature. I resent having lies told about my dead father who in four weeks leading to his death received only two church visits that I know of. But I am not surprised anymore when men use "God" to push their personal agenda. I've noticed it for 40 years in ministry. The ministry is a great career for many who have no other employable skills. Just stop lying about others and slandering people in the name of Jesus. At least TRY to have a little integrity. You are correct in addressing this insult. The Pastor should not have attacked you publically. He should have followed what the Bible says and contacted you privately if he had an issue with you. You were raised in that church and attended it for many years. Your father stated more than once that the pews did indeed need to be filled before any expansion. Also if the building was in such poor shape, why could they sell it to another church? Was it not good enough to be repaired and preserved? Or was it to be shunted to another less deserving church? You certainly have the right to state your position and opinion. It was the Pastor's responsibility to maintain the domain name. And there are many other domain names he can procure. The bullying tactics used by Pastors are shameful and this one in particular is not worthy of being called a "Shepherd" nor does his bullying show a servant's heart. About Me and Why This Blog ! I was born in Alamo and raised at First Baptist Church of Alamo. My concern is when personal agendas are put forth as "God's will." I am concerned when discenters are shamed and snubbed. I am concerned when people in the church are manipulated. I am concerned when half-truths, myths and lies are presented as truth. I am concerned a plan is presented as "God's will" and if you disagree with it, than you are labeled as going against God's will or going against God. I am concerned when I see obvious spiritual abuse and manipulation by the alleged spiritual leadership. I am concerned when people in the church are hurt by the leadership. I am concerned when long-time members of the church are disrespected. I am concerned when one side of an issue is presented as "God's will" and opposition is minimized or completely ignored. I am concerned with a "bully vote" involving millions of dollars, which is what happend at First Baptist Alamo. I am concerned that, by embracing error, the members of First Baptist Church Alamo are missing out on the REAL WILL OF GOD, which is to actually win souls (a wise thing), not build a country-club on the highway. I am concerned that the leadership of the church will move out of town, leaving the congregation with millions of dollars in debt. So I tell you, don't believe everything you read on this blog. Don't believe everything you hear from the pastor. Don't believe everything you hear from the deacons or from the building committee. Check out the figures and facts for yourself. Check out the motives of the person making the claims. Especially, check out the options, check out all the options. Remember, when someone says, "God said it," you can bet things are usually NOT what they seem. When someone brings "GOD TOLD ME" into the conversation, you can be sure someone is lying. When someone says your disagreement is against God's will, that is spiritual abuse. Examine everything. Consider all the options. Keep your hand on your money.